This is a straight forward deal for you to license the rights in your photos or videos to some other person or organisation. It is likely that you will wish to grant the licence to a television or film production company or maybe a website operator. They, in turn, may wish to sub-license to similar organisations in other countries. This agreement talks of photos. It could as easily be used for any other copyright product - a drawing, artwork, a sketch. But if your item is of high value, do use one of the fuller agreements are available at High level IP licence and sale agreements. This is a simple deal for ever. 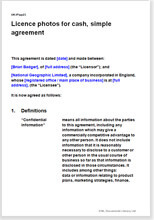 However, the agreement also sets out basic terms of any sub-licence and strong terms to protect your interest. The result is that you may not interfere with the licensee’s use of the photos or videos but your origination and your ownership must always be acknowledged by them. Your reputation as a photographer will be enhanced. You may be an individual or working through a company. The financial arrangement is a simple cash sale. This is a very simple agreement. Net Lawman offers several more complicated versions which would be suitable for a licence of photographic material. Each has different terms. They cover more complicated sub-licences; licence terms that are limited in many ways, royalty agreements, and much more.